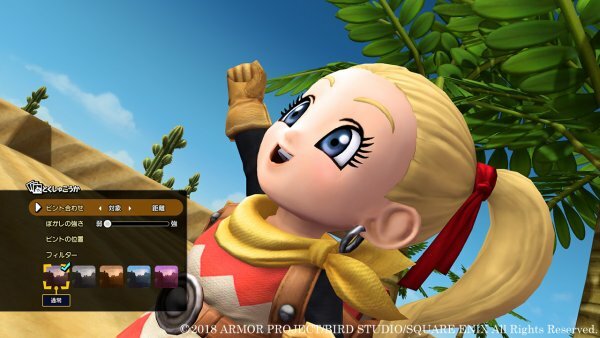 As we head towards Dragon Quest Builders 2‘s Japanese release date, more and more info about the game continues to trickle out. There’s a good amount of new stuff here, including everyone’s favorite contemporary game feature, Photo Mode. This information comes from Gematsu, which published translations of new materials from the official Dragon Quest Builders 2 website. Along with Photo Mode, Square Enix also introduced the Bulletin Board and the Builder Pencil. A pack of new screenshots accompanied the new info, which you can check out down below. Photo Mode looks to operate how you’d expect, with the ability to manipulate the camera, apply filters, and toggle the player character on and off. Once you’ve taken your photos, you can paste them to the Bulletin Board. Plays can view each other’s photos online and “like” them, and the Bulletin Board will display the most popular photos first. You can also visit the world in other players’ photos, if they’re published in a terrain set. The Builder Pencil is another community-driven tool, this one letting you recreate buildings you see from other players. When you’re hanging out around something another player made, you can trace the area around the building with the Builder Pencil. The pencil will translate what you traced into a blueprint, so you can go back to your game and build away.